Market State 1 (Bullish) – The US Stock Market, as measured by the S&P 500, remains in a bullish Market Environment. A bullish Market State is one with the highest probability for compounded returns, through limited risk. Canterbury Volatility Index 67 Day - (CVI 71) – Volatility, as measured by the Canterbury Volatility Index (CVI) remains in stable condition. Volatility has been between 70-80 since March 12th, experiencing a steady decline. Shorter-term volatility, as measured by a 10-day CVI, is currently at CVI 48, which is just above “extreme low” volatility. Shorter-term CVI measures the trend and pace that volatility is heading (up or down; fast or slow). As previously mentioned, the S&P 500 is currently in Market State 1. Along with it, the Dow Jones Industrial Average and Nasdaq 100 index are both in Bullish Market States. The Russell 2000, on the other at hand, is currently in Market State 11 (long-term is negative but could turn positive soon and proceed into a bullish Market State). Each of these broad indices are composed of some combination of both Value and Growth stocks, either large cap, mid cap, or small cap. Today, the A/D Line continues to show broad market strength. The previous high on the S&P 500 occurred on September 21st. This was also at the time a high for the A/D line. 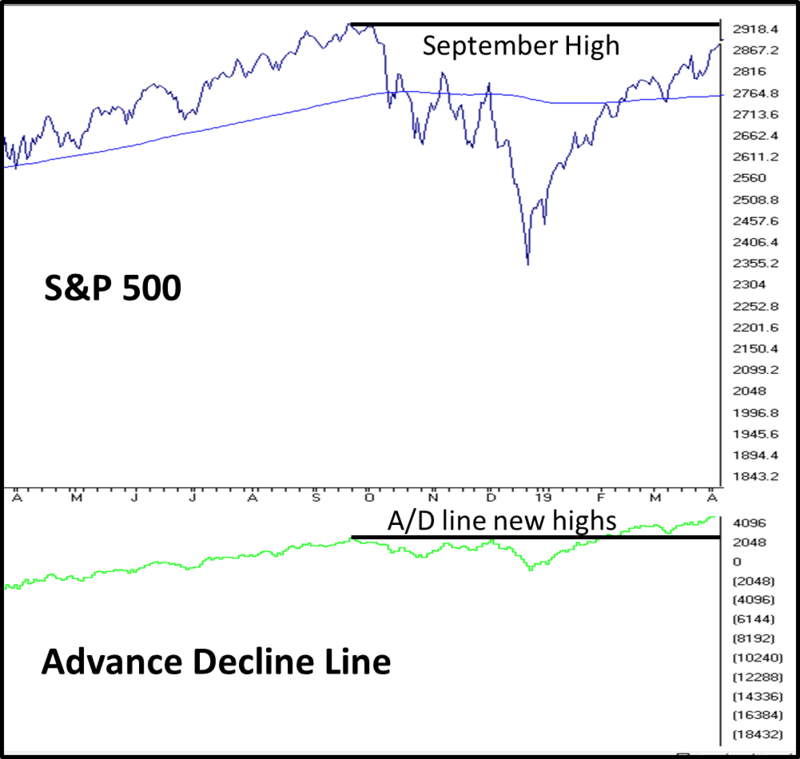 Since then, we can see from the chart below, the A/D Line has been putting in new highs since February 1st, while the S&P 500 has not yet hit a new high (Positive Divergence). This means that many stocks are participating in the recent rally off the December lows. The US Stock market continues to approach its old September all-time high. Volatility is continuing to decline, and the Advance Decline line is continuing to rise. Not all investment styles, sectors, or alternatives will be in bullish environments at the same time. All liquid traded securities, driven by supply and demand, will experience bull and bear markets. Adapting one’s portfolio to hold securities that benefit from the current market environment is crucial to risk management. All securities can experience large drawdowns. An Adaptive Portfolio Strategy, like the Canterbury Portfolio Thermostat, has the ability to navigate to the ever-changing market environments by utilizing a diverse universe of securities to select assets that will benefit from the current environment- bull or bear.